Brett Howard shares the Asymmetrical Movement Patterning technique that he learned from Romana Kryzanowska. She would work the weaker side, the stronger side, and then go back to the weaker side. He demonstrates this technique with Footwork and Pelvic Lift on the Reformer, and One Arm Pumping on the Wunda Chair. Enjoyed going this simple yet effective workout. A tutorial on correcting asymmetrical tightness in internal rotators of the hip would be helpful as well- Thank you ! These are wonderful exercises for asymmetry and I know from workshops with Brett this is much harder than it looks. Great job Amy!! Thanks for sharing Brett!! Thank you! I second Taru, above. thank you so much, amazing work! 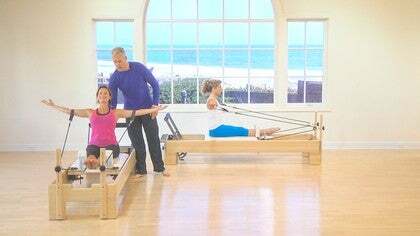 i really admire you Brett as a pilates instructor!